Chief Minister Virbhadra Singh has raised the issue of expansion and modernization of all the airports in the State with the government of India. Chief Minister, who met Union Civil Aviation Minister Ajit Singh in New Delhi today, raised this issue. He requested for increase in the length of Shimla airport runway so as to facilitate the landing of bigger aircraft in the state. He demanded to provide adequate budget to the airport authority for restoring the original length of the run way in time bound manner so as normal flights could be plied on the airport before the winter tourism season. Chief Minister apprised the Union Minister that the length of the Shimla airport runway had been effectively reduced to 3800 feet from original runway length of 4100 feet due to soil erosion. He said that at present the ATR aircraft cannot take-off with full load. The airport authority of India had drawn up plan to restore the original length of the runway which would mitigate the load factor problem. He offered all infrastructural and other assistance from the state government in restoring the original length of the run way. 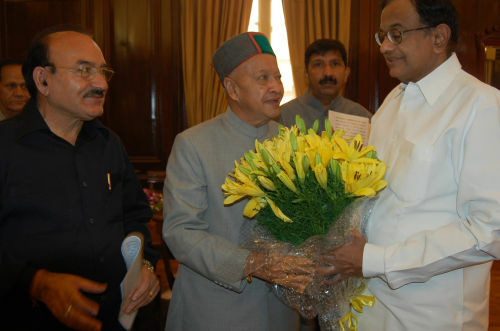 Virbhadra Singh demanded the expansion of the airport and increase in the length of the runway by at least 600 ft so that the bigger aircraft could land safely at Shimla airport. Chief Minister further requested expansion of Kullu airport adding that the state government had conducted feasibility study through IIT, Roorkee in consultation with airport authority of India. It had concluded that the Kullu airport could be further expanded and the presentation of the study had already been sent to the civil aviation ministry. He requested for allocation of adequate funds for the expansion plan of the Kullu airport. Virbhadra Singh requested for setting up advance technology and equipments at Shimla, Kangra and Kullu airports so as the larger aircrafts could land during all weather conditions. He asked for time bound action in this regard keeping in view of safety and convenience of the air passengers. He also requested the union minister for developing infrastructure facilities for landing of large bodied fixed wing aircraft in the state and said that state government had submitted a proposal to airport authority of India for conducting feasibility study for new airport at Kandaghat in Solan district. He requested the union minister to direct the airport authority of India for identifying the new locations for setting up big modern airport to meet the growing demand of air services in the state. Chief Minister also requested to start smaller aircraft services of Air India to the state on the pattern of the north eastern states and also provide cheap and reliable air services in the state .He demanded construction of airport at Kaza in Lahaul-Spiti district on the pattern of Leh airport and said that Kaza airport will be more viable both economically and technically in comparison to Leh airport. Besides it would also boost the tourism in entire tribal and snow bound areas of the state which had immense tourism potential. Ajit Singh said that top officials of the civil aviation ministry would hold detailed discussions with the Himachal government officials on the expansion and modernization of all the airports in the State. He said civil aviation ministry was giving top priority for ensuring reliable and economic air services in the state. The ministry was exploring the possibility of plying the private airlines services in the state which had smaller aircrafts and would work for lasting solution of the problem.